The No. 1 Ladies’ Detective Agency by Alexander McCall Smith ~ 1998. This edition: Abacus, 2003. Paperback. ISBN: 0-349-11675-X. 233 pages. Mma Ramotswe had a detective agency in Africa, at the foot of Kgale Hill. These were its assets: a tiny white van, two desks, two chairs, a telephone, and an old typewriter. Then there was a teapot, in which Mma Ramotswe – the only lady private detective in Botswana – brewed redbush tea. And three mugs – one for herself, one for her secretary, and one for the client. What else does a detective agency really need? 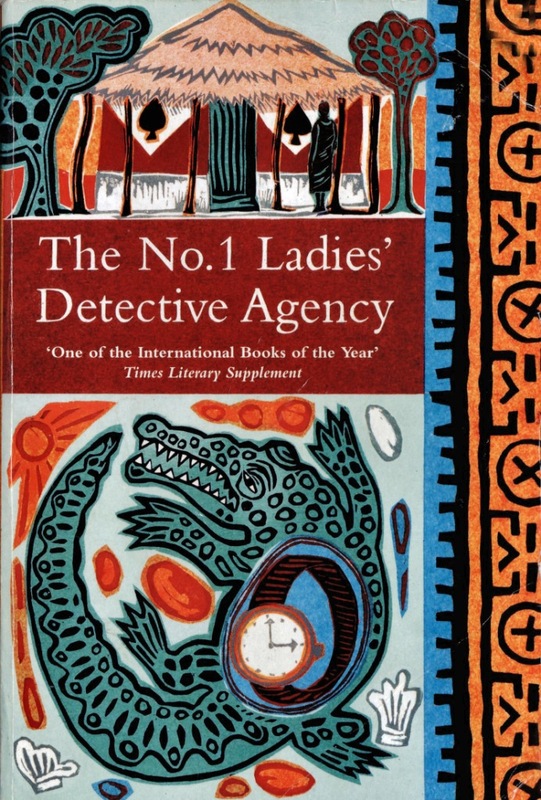 Detective agencies rely on human intuition and intelligence, both of which Mma Ramotswe had in abundance. No inventory could ever include those, of course. Our heroine in this low-key character portrait/detective novel is one Precious Ramotswe, thirty-four years old, once married but long deserted by her handsome but brutal jazz musician husband, beloved daughter and sole heir of the late Obed Ramotswe, who sells her father’s prized herd of cattle (with his prior permission) in order to set herself up in business. Always an observant sort of person, and provided by nature with a strong moral sense, Mma Ramotswe sets out to solve problems, to right wrongs, and perhaps to lay a few personal ghosts. This likeable book full of homey snippets of wisdom caught the attention of the reading public – could it have been helped along by its two Booker Judges’ special citations? Its Times Literary Supplement International Book of the Year designation? – and took off like a small but blazing rocket. Seventeen sequels have followed, all of them with long and quirky titles, and all just as charmingly readable as the first. Or at least so I am assuming; I think I stalled out at number six or seven, vaguely surfeited by the constant good-natured mullings and musings of this small-town wisewoman. Don’t get me wrong, I fully intend to catch up to Precious and her companions one day. Just not quite yet. I don’t think I need to get into plot synopsis and suchlike here; this is such a well-known tale that the internet is crowded with all sorts of reviews. Suffice it to say that it was a notable book way back in 1998, and so serves as an ideal Century of Books candidate for its year. And it was fun to re-read this rainy Canadian Thanksgiving Sunday, as I sit in my comfiest chair and nurse a worsening head cold passed along to me by a friend’s winsome but overly affectionate (at least while contagious) youngsters.